Successful and unique music lessons for all piano keyboards, string and woodwind instruments, all ages, all styles, all levels. Mary's Method specializes in building a solid foundation for budding musicians to build upon. Instrumental and vocal instruction is available for both private and group. Music is embraced by a program designed especially to accommodate the needs of the student. This method cares about the well being and confidence of each student. Learn how music travels, how to interpret rhythm, read sheet music, improvise, harmonize, compose, arrange, accompany or play by ear. Develop your physical and conceptual skills, imagination, creative expression, and rhythm neatly woven into a program specifically designed for each student and their learning skills. 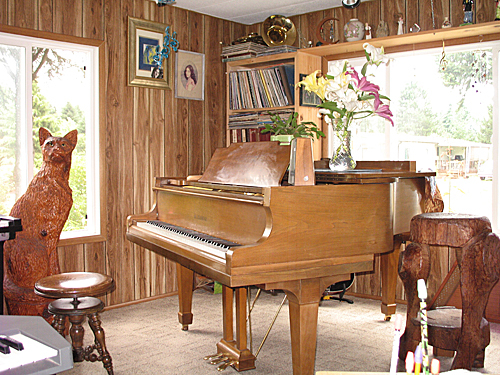 Instruction is available at Expressions Music in Mary's lovely and spacious studio in the Horseshoe Lake area of the Key Peninsula, serving Gig Harbor, Purdy, Wauna, Key Center, Home, Lakebay, Longbranch, Port Orchard, Burley, Olalla, and surrounding areas. The studio is convenient, comfortable, well equipped and easy to find. Teacher and author of Hello Music, Mary Alice Salciccia is a gifted musician, dedicated and talented teacher, arranger, composer, recording artist, musical director and performer. She began to study music as a prodigy at the age of 5, turning professional at age 16, and has been teaching and performing in California, Texas, Alaska and Washington for over 35 years. Contact Mary Alice by phone at (253) 857-3788 or email mary@expressionsmusic.com and she will be happy to address your needs and concerns. Click the image below to learn more about Mary's new book! 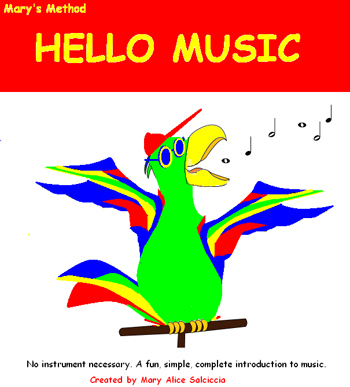 Hello Music!